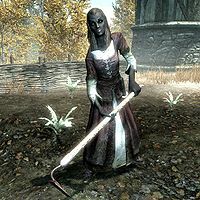 Aduri Sarethi is a Dunmer farmer, living and working with her sister Avrusa Sarethi at Sarethi Farm. She is quite bored of the farm life, and wishes she could live in one of the capital cities, or return to Mournhold and take up painting. Aduri wears a set of farm clothes with a pair of boots, and carries a belted tunic. She is equipped with a leveled dagger, which can be up to elven quality at level 20. She also carries a selection of common items and gold. She will begin her day by getting out of bed at 6am to have breakfast. After eating, she will begin her chores around the farm at 7am. Once she finishes her farm work at noon, she will begin jogging around the farm until her dinner at 6pm. After taking an hour to eat, she will go back to her patrolling until she retires to her bed for the day at midnight. Attempting to speak to Aduri will have her tell you about her dream to leave the farm, her aspirations to become a painter, and her wish to return to her home in Mournhold or to one of the capital cities. "This place is boring. Nothing but the same thing every day. Sigh. ", "I wish I could head to one of the capital cities... maybe even back to Mournhold. Anywhere but here. ", "One day I hope to become a painter, but at this rate it looks like it's never going to happen. ", "Can you imagine how wonderful it would be to set what you see on a canvas so you'd have that memory forever? ", and "My sister keeps telling me that the farm keeps us alive, but I don't really call this living." You can ask her sister if Aduri causes a lot of trouble, to which she responds: "Aduri is what some would call a free spirit, but around here there is a tremendous amount of work to be done, not to mention dangers that she is not ready to face." A script note for Aduri and Avrusa's conversation on if she can move to the city to become a painter suggests that Avrusa was originally her mother in development, and not her sister. This page was last modified on 25 September 2013, at 18:17.